You are here: Home / News / Car News / Watch this incredible 900hp Ford Mustang drift a four-leaf clover! Ford Performance took a slightly different approach to celebrate St. Patrick’s Day for 2019. Forget the usual downtown parades or pints of Guinness. Instead, Ford’s ‘go-fast’ department opted for a dramatic drifting stunt on a clover leaf interchange. Sensibly, the road in Fort Worth, Texas was closed to the public, allowing drifting maestro Vaughn Gittin Jr. to do his thing. Given that Gittin Jr. became the first person ever to drift the entire length of the Nürburgring Nordschleife circuit, a simple highway junction should have been a walk in the park. The 38-year-old Formula Drift racer used the same 900 horsepower Ford Mustang RTR machine that he drove in last year’s German extravaganza. Although here it has fittingly been turned green for the special event, along with a lucky four-leaf clover hanging from the rear view mirror. The green LED lights illuminating the smoke from the tortured rear rubber is also a neat touch. For those feeling inspired by Vaughn’s latest escapade, they can attempt to recreate it virtually with the latest updates for the Xbox One Forza Motorsport series. Both Forza Motorsport 7 and Forza Horizon 4 recently gained a trio of Ford Mustang RTR drift machines. The only challenge is to find a suitable four-leaf clover to cause havoc on in the game. 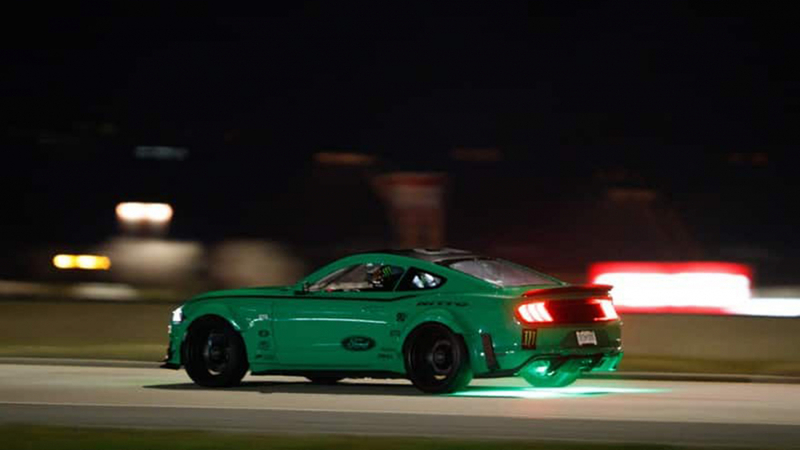 https://www.motoringresearch.com/wp-content/uploads/2019/03/2019-Ford-Mustang-RTR-four-leaf-clover-drift-001.jpg 1080 1920 John Redfern https://www.motoringresearch.com/wp-content/uploads/2018/12/mr-top-motoring.svg John Redfern2019-03-14 19:02:082019-03-19 06:26:36Watch this incredible 900hp Ford Mustang drift a four-leaf clover!